Mission. Action. Nourishment. Discipline. Education. Love. Attitude. Mission creates meaning, and meaning is the fuel for sustained achievement. People are willing to lay down their lives for a worthy cause. Do you have a mission statement for your life and career? What about for your family, team, or organization? Action. Too many political leaders today do not back up their empty rhetoric with action. Mandela at his core was an activist, a man of action; so much so, that even in his later years amidst failing health when he announced he was “retiring from retirement,” he still managed to found the Nelson Mandela Legacy Trust promoting economic assistance to Africa. He also campaigned successfully for South Africa to host the 2010 FIFA World Cup. Are you actively campaigning for your mission? Do you back up your words with action? Nourishment. Imprisoned for 18 years at Robben Island for his anti apartheid activities, Mandela was confined to hard labour in a lime quarry where the glare of the sun burned his tear ducts, making it difficult for him to weep for his lost youth. 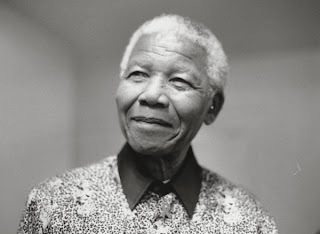 Despite his privations, Mandela found solace through literature, nourishing his inner soul and that of his fellow inmates by reading Henley’s Victorian poem “Invictus” over and over again. During his imprisonment at Pollsmoor Prison, Mandela smuggled a letter of encouragement to South African trumpeter Hugh Masekela, inspiring him to write the upbeat anthem song, “Bring Him Back Home,” thus nourishing the souls of his supporters through music. Years later, after the song fulfilled its wish, a free Mandela as first black President of South Africa, provided nourishment to François Pienaar, captain of the national rugby team, the Springboks, through moral encouragement and support, giving him a copy of the “Man in the Arena” passage from a Roosevelt speech. The Springboks went on to win the 1995 Rugby World Cup – providing nourishment to a nation. How are you nourishing your inner soul and the souls of those that matter to you in times of adversity? Is there a poem, a passage, or play you can read, or a recording or film clip you can play to provide nourishment to family, friends, fellows, and even foes? Discipline. Mandela was a dreamer with discipline. Even during imprisonment, every morning without fail he would get up and perform his daily exercise regimen, which consisted of up to 45 minutes of stationary running in his cell, a hundred fingertip push-ups, two hundred sit-ups, and other callisthenics. His daily routine kept his mind sharp and alert so he could stay focused on his mission. Education. Mandela was a strong advocate for higher education. Earning his law degree from the University of Witwatersrand, Mandela was a practising lawyer who founded South Africa’s first black law firm with Oliver Tambo in 1952. Excellence is about education and execution. In tough times, many organizations have cut-out the educational component, focusing solely on execution. That posses a danger, for if you continually preach execution, execution, execution with little to no education, the proverbial well will run dry. How are you incorporating education into your life? Have you thought of getting higher education beyond your diploma, certificate, or degree? Consider adopting the daily discipline of reading an hour a day in your field. Love. You don’t have to like your enemies, but you can learn to respect them. And respect is the first step toward love. How did Mandela accomplish the impossible task: to love thy enemy? He took it upon himself to learn everything he could about his Afrikaner oppressors by studying their culture, history, and literature. The empathy and understanding gained from his efforts was instrumental in getting him freed from prison; and he returned not a bitter man, but a compassionate leader – offering reconciliation over retribution. It was this colossal love that conquered hatred that earned him the Nobel Peace Prize and Presidency of South Africa. What act of love can you do this week in memory of Mandela? It doesn’t have to be a colossal act; start small, like lending a helping hand to someone in need, or paying a genuine compliment to a foe. If nothing comes to mind, perhaps the greatest enemy of all is within. Learning to forgive yourself and love yourself unconditionally helps unburden the soul and clears the way for expressing love. Attitude. Attitude is a way of thinking and behaving. It is our attitude that ultimately determines our altitude in life. Regardless of the circumstances life brings us, we always have the choice to respond or react accordingly. Mandela chose optimism, hope, and possibility over despair, hopelessness, and helplessness. He was certain that he and his people would one day be free. Carefully observe your attitude. Do you focus on the problem or the solution? Do you view yourself as the victim or victor? Mandela clearly envisioned himself as the victor. He was and is Invictus, which means ‘unconquered.’ Unconquered by hardships, unconquered by hate, and in some respects, even unconquered by death. For although the world has lost a great leader, a light has not gone out in the world, but is reborn, blazing brighter in the hearts of millions who honour his heroic legacy of hope. Sharif Khan is author of the inspirational leadership book, Psychology of the Hero Soul. "[Sharif’s epic] offers the reader more than just a classic tale of valor, betrayal and vision. It is a fiction-based guidebook to overcoming obstacles and achieving a morally satisfying and pleasurable way of life." As WWII draws to a brutal end, Hitler’s storm cloud of tyranny descends upon Hungary’s Jews. A sad yet soaring tale of a Hungarian Jewish family caught up in the cruel chaos, Joseph Kertes’ third novel, GRATITUDE, is a sweeping literary achievement that serves as a powerful humbling force – taking the reader through the dark night of the soul and into the spangled light. Sixteen-year-old Lili Bandel emerges from her small Jewish village of Tolgy as the sole survivor in a place turned into a desolate ghost town – evacuated by German soldiers. She evades capture – her blue eyes and blond halo shielding her – managing the long trek to Budapest alone, where the well-to-do Becks take her in as their own. Like many Hungarian Jewish families deriving false hope of immunity from Hungary’s alliance with Germany, the Becks, too, lived in their own form of denial and delusion, failing to see the proverbial ‘writing on the wall’ in time and heeding warnings from friends and relatives to get out of the country, until too late. Painfully, tragically, with great skill, humility and respect, author Kertes leads us through the harrowing journey of the Becks to the gates of Hades as they struggle to hold on to their dignity and humanity in the tightening death-grip of Hitler’s hate machine led by Adolph Eichmann. In the dark soil of despair and deprivation, new roots of hope and heroism spring forth as one of the family members, Paul Beck, a lawyer disbarred from practice because of his Jewish faith, teams up with the noble Swedish diplomat, Raoul Wallenberg, risking their lives to save thousands of Jews by forging Swedish passports. Some make it, some are not so fortunate – losing their lives to the randomness of war, the privations of gruelling labour camps or the gas chambers of Auschwitz, or succumbing to deep psychic wounds post-war. What sets this book apart from other Holocaust books is that the heroes and villains are flawed human beings. One side isn’t always right while the other side always wrong. Compassion and cruelty often co-exist – revealing themselves in the unlikeliest of people and places. While the country is left in ruins – pillaged by Germans and Russians – true restoration begins, restoration of buildings and temples and souls. Restoration of dignity and hope. The story is a clarion call to us all to be alert and aware of the holocausts occurring all around us – and to act with courage and compassion. It is also a testament to the resiliency of the human spirit and the ability to prevail in times of darkness, as the author himself has prevailed over the dark psychology of his own demons, with a spirit of gratitude. By Lewis Mehl-Madrona, M.D., Ph.D. In fact, Dr. Melh-Madrona suggests, “On the whole, social relationships and experience are perhaps more powerful in changing our brains than drugs.”* Certainly, a number of so called ‘antidepressants’ out on the market prove no more effective than placebos. There are positive and negative consequences to this story. One of the downsides is that often times a person experiencing illness enters the traditional healthcare system and is given a story: bipolar disorder, schizophrenia, clinical depression, ALS, MS, chronic pain such as fybromyalgia, etc. Sadly, what often happens next is that when the individual is institutionalized to receive ‘care’, the entire medical team and support staff’s focus centers around empowering the story rather than the person. Healthcare turns to health-scare and instead of healing, the condition is often prolonged and/or exacerbated. The upside here is that through narrative psychiatry and community/group storytelling, through collaborative interaction, empowering stories, or counter narratives, can be developed for dis-empowering the bad stories and empowering the person (vs. patient) to heal. Dr. Melh-Madrona is asserting that many genetically linked diseases can, over time, be better managed, mitigated, and even transformed into healing success stories through the power of storytelling in conjunction with medical treatment, especially through collaborative community interaction. In his book, he gives example after example of empowering stories he’s shared with clients suffering from various illnesses and their positive transformation from enacting these stories and attending community healing circles. The great thing about healing circles is that anyone can start one up in their own community, consisting of a small group of people who are dedicated to each other’s healing. The group meets regularly in a circle. Each member shares their story by holding a ‘talking stick’ which is passed around the group. The stick is passed only when one feels heard and they’ve fully expressed what they have to say. Nobody else can speak when a group member is holding the stick, which reinforces active listening among all members and activates group healing through narrative expression. Also, when a group member expresses a challenge, the rest of the group can pitch in by sharing whatever they feel they can offer: prayers, massages, reiki, advice, stories of overcoming similar challenges, etc. A good takeaway from this book, is that if you find yourself in a rut, be it personal or professional, examine yourself and start replacing your negative stories with empowering ones, and consider joining a support group to express your stories in a nurturing environment. One of the reasons why Weight Watchers and Alcoholics Anonymous have been so consistently successful is the group sharing and camaraderie in community that occurs on a regular basis. I highly recommend this book for all helping professionals and anyone searching for stories to heal the mind. * One caveat the author notes is that “people taking psychiatric medications should never stop taking them abruptly, as serious withdrawal symptoms can occur.” Also, the advice given here and in the book should not be used to treat a serious ailment without consulting a qualified medical professional first. Guber, CEO of Mandalay and former chairman of Sony Pictures, is a world-class storyteller who gives plenty of business and organizational storytelling examples of how stories can be used effectively to influence, inspire, and innovate. Another summer favorite of mine and a real entertaining read! I wish you a successful storied life and encourage you to Carpe Fabula (Seize the Story!). Please visit and “Like” my new Facebook Author Fanpage! Some really inspiring stories of courage, conviction, and compassion…and some positive news for a change! Worth listening and sharing with friends and family. VIVA LAS VEGAS! Author 101 University is coming to Vegas in October for its renowned publishing success course. Ideal for: aspiring and established authors, writers, coaches, speakers and independent publishers. If you’ve ever dreamed of writing and publishing a book, or if you’re an author looking to fast-track your book publishing success, this is the place to be! Recommended for story writers, screenwriters, transmedia storytellers, filmmakers, and novelists who love film. I will be attending this event and look forward to networking with fellow creatives. Hope you can join me. To subscribe to the Hero Soul ezine, visit www.HeroSoul.com and click on the ‘newsletter’ tab. * Stories have the power to transform, inspire and motivate. But they also have the power to tear down and destroy. Story is the lens from which we perceive the world, governing our behavior and ultimately leading to a self-fulfilling – or story-fulfilling – prophecy. I’ve tried so many times and failed. Nobody cares. It’s impossible to find real, fulfilling work in these tough economic times. I guess I’ll have to settle for less. Celebrities have it so easy; they have no idea what life is like for the rest of us. When will I get my lucky break? Who will discover me? It’s no use, I’m just not talented enough; I’m not worthy of success. Why does life have to be so unfair? There’s little to hope for in this dark world. People care because I CARE! I’m not afraid to show PASSION & ENTHUSIASM in my work. I can solve any problem if I’m committed enough. Every setback, rejection, failure is a stepping stone to success and is in fact an OPPORTUNITY to learn, grow and be creative. I create my own luck by working hard and smart while others complain. I prosper by doing what I love and I deserve all the success coming to me because I add value in people’s lives. I look forward to a bright future, and I’m doing my part by shining a light in the world and making a difference in my community. I’m truly blessed! Two very different stories leading to two very different outcomes. While none of us would like to think we’re remotely associated with Story #1, the fact is that when we interact in the world and associate with some of our peers and ‘friends’ or turn on the news, elements from Story #1 begin to break through the inner realms of our unconscious. If you’re not careful about it, those negativity seeds will take root in the soil of your unconscious and spring forth weeds that will begin to entangle your dream story and pull you down. It’s important to be vigilant right from the onset. When you catch yourself voicing negative story threads, saying something like ‘cancel, cancel, negative thoughts and suggestions have no influence over my mind’ might seem a bit hokey, but it actually does help check the flow of negativity by raising your awareness. A simple exercise you might want to try to crystallize your dream story is to write a one page short story where you are the HERO of your own story. Describe your IDEAL DAY from dawn to dusk. What would your ideal day look like, assuming all your dreams had come true? Write your story in the first person present tense using lots of vivid detail: what are you seeing, hearing, smelling, tasting, thinking, touching, and emotionally feeling? * Excerpted from the FREE Hero Soul ezine on personal development. To subscribe, visit www.HeroSoul.com and click on the 'newsletter' tab. ‘THINK BIG’ without cojones is like faith without works – it can only get you so far. Talent agent and powerbroker, * Jerry Weintraub, had a dream of taking Elvis on tour. At the time, Jerry was just a smalltime promoter while Elvis was the biggest star on the planet. Everybody thought he was nuts to think he could get Elvis, but he didn’t let that stop him. On a piece of paper he wrote down his dream: Jerry Weintraub presents Elvis Presley at Madison Square Garden. He called up Elvis’s manager and shared his dream but was told ‘NO’. Every single day, for the next 364 days, Jerry called up the manager and was told the same thing: it’s NOT going to happen. On the 365th day, the manager called him up to say he could get Elvis – if he met with him in Vegas the next day and brought a million dollars. Jerry worked his network like mad to raise the money and everybody thought he was mad, but finally, at the last minute, an investor and big-time Elvis fan gave Jerry the million dollars he needed to seal the deal. The rest as they say is history. Jerry went on to represent some of the biggest stars in show business including Sinatra, Elvis, Dylan, and Denver. By exercising king-kong-sized cojones, he reaped king-kong-sized rewards! If you’ve ever dreamed of publishing a book or if you’re an author and want to overcome limiting challenges and experience a breakthrough, then you don’t want to miss this crash course in publishing success! Go today to http://bit.ly/hSCMys and get the details and watch videos of inspiring success stories. "By all outward appearances, Russell Williams looked and played the part of a shining hero who could do no wrong; a rising star soaring high on the national stage before going down in flames as perhaps the most ruthless sociopath in Canadian history..."
You can read the rest of my opinion piece, "The darkness that lies within us all" on the Winnipeg Free Press op-ed page. (A side to the story I felt the media was not covering).